Dumb Dumber Harry Tuxedo Adult Men Costume;This powder blue tux is perfect for Halloween or next time you attend the International Preservation Society gala. - Costume includes hat, jacket, pants and bow-tie/dickey. 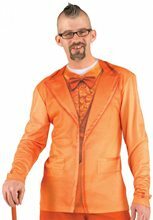 Wear this Deluxe Orange Tuxedo to your next prom or formal event to make a bright and bold statement. Or join a friend in our blue tuxedo to look like the hilarious duo, Harry and Lloyd from the Dumb and Dumber movie! And put on the Ritz when you add great accessories like our orange cane, top hat and shoes!